← The story of Rusty and Timber makes national news! It’s time to break camp again. After a few days of exploring the coast north and south of Florence, Oregon, the crew and I mosey southward, stopping for lunch, potty breaks, photos, and ocean-gazing. I drive out to Cape Blanco and find it is obscured by the heaviest fog I’ve come across since arriving at the west coast. We stop for the night at Harris State Park Campground near Brookings in southern Oregon. It’s now late in the afternoon on a Friday. Not my usual timing for a new camp. We need to keep moving as camping along the coast is more expensive than our budget is used to. Harris is a big, well-designed campground sitting in a gazillion-dollar-gorgeous location. We pull up to the entrance booth and talk with two very efficient ladies handling 58 reservations, as well as no-reservation wanderers such as ourselves lined up for entry. The lady looks at my rig and asks if I’d be happy with a tent site. The campsite I pick is the most difficult back-in I’ve faced so far. There’s a campsite opposite ours with an Airstream and a tow vehicle blocking the space needed to turn off the narrow lane. Fortunately the owner immediately jumps in his SUV to get it out of the way and motions that I can pull up into his site to get into position. I ask him to watch that I don’t clip his Airstream’s tongue when the nose of the PTV swings around as I back in, because it’s gonna’ be close. At one point the helpful gentleman asks if I want him to try it. I respond with a smile, “What would you do that I’m not doing?” He says to try turning the wheel more sharply. I show him how it quickly leads to a jacknife. He nods his head. A few more tries and the PTV is in her new home! By the time I get us settled and I take a little break, it’s almost dusk. Spike and I accompany Bridget in her stroller down to the day use area. 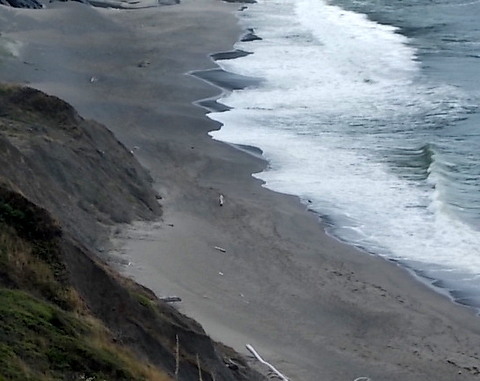 I’ve become accustomed to these areas being places where you can look out over the Pacific or you can climb down a long and steep embankment to the beach. I don’t expect we’ll be going to the beach, what with Bridget in a stroller. To my surprise, there’s a walkway down to the beach! We explore the tidal pools and beach a little bit. Then we sit at a picnic table and watch some guys in wet-suits ride boards on the waves. Since I didn’t expect to be on the beach, I didn’t bring my camera. It’s really getting too dark for photos anyway. We only stay at Harris State Park Campground for one night. For a crowded campground, it’s amazingly quiet at night. We get a good night’s sleep. The shower is hot which is a delight what with the increasingly cold and damp weather. Before leaving I refill empty water jugs and make a stop at the dump station. We’re off for a brief visit to Cal-uh-for-neye-aye before returning to Oregon via the road to Grants Pass. This entry was posted in Simple living and tagged Airstream, Brookings, California, Cape Blanco, casita, Florence, Harris State Park, lighthouse, Oregon, Pacific, RVing, surf boarding, Tow vehicle, travel trailer. Bookmark the permalink. More great pics!!!!!! I really liked that campground, first one I stayed at on my journey up the coast. Have a great stay in Cali and be safe. I like the way the campground is close enough for a walk to the day use area and the beach. We did go down a trail (I carried Bridget) to see a lovely pool created by the waves crashing through an opening in this huge rock outcrop. The water was a clear green, if that makes sense. Lovely. Read the story about Rusty and Timber in the AZ Republic. Sure brought a tear to my eye, because anybody who has lost their dog knows the joy felt when they are found. Love the fact you are retired and seeing the USA. I would love to do that and I will follow your blog and hopefully get the courage to get rid of a big house and all the trappings and live a simpler life. Do you ever get scared being alone on the road? I, too, love the fact I’m retired and seeing the USA. I love that I’m living a journey while seeing our country, rather than jetting here and there, dropping out of the sky, so to speak. Getting rid of the big house and all that goes with it is very hard for some, not so much for others. As long as you do what’s best for you! No, I never have been scared being alone on the road. I’m not bragging. It’s just the way it is. Now that I think about it, the only times I’ve been scared were times living in a regular house! I saw a restaurant — can’t remember if it was in Florence — called The Little Brown Hen. Maybe that’s the one? Oh how I envy your lifestyle! I am a new fan and searched the blog for some info on Bridgett and why she is in a stroller, but could not find it. I can’t wait for your next blog installment. Please tell all ——– I would seriously love to do this!!! Hi Shawna! Bridget was chasing a chipmunk with Spike when she yelped and hit the dirt. This took place at Ice Cap Campground if you want to search for the post. BTW, welcome to my blog! I hope you’ll keep coming back. Pictures are beautiful. They are probably as close to the Pacific as I will get. So glad you are enjoying life. Me and the rest of your followers love to read what is next. Hi Pauline.. Thanks for helping identify the post. I’m running short on power (camped in shade again) and I couldn’t remember the name of it! Time for you and Jerold to get a camper! Ha! Thanks for letting us ride along. Enjoy the blog. You’re welcome, Jim (although I don’t know which Jim you are!) It doesn’t matter. I never met a Jim I didn’t like! 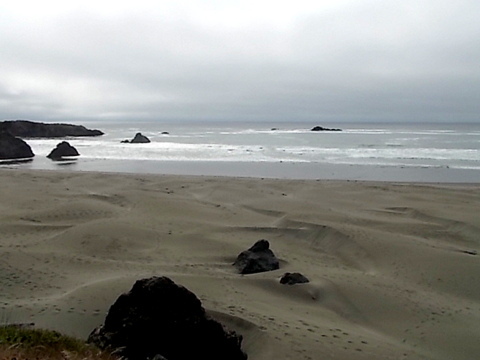 Are you loving the coast….now that it seems the fog has cleared? Bridget needs “big tires” on her stroller….ugh that would have been a chore pushing her across sand/beach. Oh so you know…she said she doesn’t mind being carried….as long as she can see the sights too! And no this blog isn’t a circus…perhaps it was just the wrong word….like homeless! Thanks for fixing my spelling error. You’re doing great…love the blog, the pictures, canine corner and your wit! Drive safe to your next destination. Can’t wait to see the next round of pictures. About the scared thing … I know there are courses one can take to have that don’t-mess-with-me aura. I don’t think I have that way about me. What works for me is not being fearful to begin with. In other words, people who scare easily are the ones who should be scared because their fear attracts bad elements. . . like wounded prey attracting predators. Absolutely…being confident tends to deter bad encounters. Rich and I really liked Harris Beach. The weather was always perfect. That part of the coast is known as the banana belt. I know the walk you’re talking about. In fact, I know every inch of the park, I think. Your pictures are beautiful, as always. I wish you could have spent more time on the coast, but I know you’ll go back. That’s the best part of your lifestyle. Are you dipping down to see the coastal redwoods in CA? I remember going through Grants Pass one year. Have a good time. Love to Spikey and Bridget. I noticed Harris Beach had very little fog. One could spend a lifetime exploring the Pacific Coast and the mountains. I hope I do have the chance to come back again. I’ve seen enough this trip to make the extra miles worthwhile. I’m glad you enjoyed the photos. Thermacell, Pat. http://tinyurl.com/8p394x8 I happen to have the lantern because I think it was out before anything else. I believe the hand held laid on the ground would be just as good. I wouldn’t be without it in mosquito and no-seeum country. We ran into mosqutoes staying near Crater Lake, too. On the west coast you can probably get one in Fred Meyers. East coast–one of the big box stores. I know Home Depot carries them. thanks, I think I will look for it on Amazon and order one. I can have it send to a friends house in AZ and pick it up on my way thru. Thanks for the info. works on no see ums? I’m getting one too! No see ums love me for some reason. Even though I’ve Lived in Oregon for over 40 years, and have lived in Astoria and Tillamook Oregon, I never tire of the beautiful coast we have. Your pictures are just the best.! By the way, a Subway gift hard is on the way to Rusty. That was a touching story. So glad they found each other again. You did a wonderful thing in your part in helping them get back to each other. 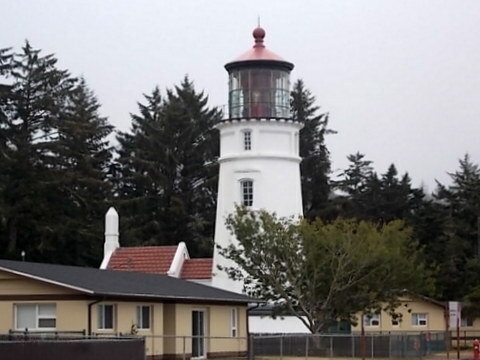 My husband was stationed on Mount Hebo which was the main reason for our first trip to the west coast, and I spent about two weeks in the Tillamook area finding all the hidden places in 2010. I also fell in love with Astoria and the Columbia River. You are so lucky to live or have lived on the coast. Thanks for the compliment on the photos…. and I’m sure Rusty will enjoy dining at Subway! Believe me, John, when you’re tired and worried you might not find a vacant campsite at all, late on a Friday in a prime area, you’re happy to get anything! This is not an area where boondocking is easy… No half-off at the Oregon State Parks, of course. Your site sounds good! Sue, all those big turnouts north of Brookings, you missed them. You could have boondocked at one of them. They are the ones I was speaking about. There is always an RV or two overnighting at one of them. i didn’t miss them. I did not feel good about staying in them. Too close to the highway, too exposed. I stopped at one and a drunk guy was hanging around. I follow my instincts. Thanks anyway. Smart choices Sue…you are not in the BOONDOCKS anymore…wise to be careful!! I also don’t like to be near traffic where sneaky Spike might get away from me. Heh…yes had a few experiences with the little rascal huh?? It’s hard for me to know where you mean . . . I’ve promised folks at Crater Lake and Klamath Falls that I’d come by for a visit . . . If you come through LA/San Fernando Valley Area let me know, have a place to park near my house. Thank you, LilNomad! At this point I don’t think I’ll be in that area. Graduated from Cleveland High. Lived in	Reseda in the Valley. 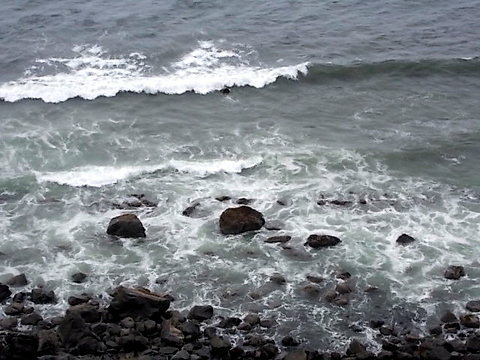 Beautiful pictures of the Oregon coast!! I would of been so intimidated to back in a trailer, no matter what size, especially with someone watching me. Good job Sue, that you maneuvered it so well. Thanks! Backing into a tight spot is 95 percent patience. Yes it’s true, small trailers are definately more difficult to back up. Your doing a fine job with your camera. Pheebs sends her best to Bridget & Spike:)). The same back to Pheebs! Thanks for the encouragement re camera. Everyone’s eye for beauty is different, formed from different experiences, I guess. I’m happy you enjoyed this set. Yes, I have “the life” — finally! Thank you so much for sharing these wonderful stories and pics. This is also the first blog I’ve ever read, yet alone followed since the story came about in the AZ Republic. I’ve now lived in PHX for 10 yrs and grew up in Erie, PA) and I was so touched, not only by Rusty & Timber’s story, but by your writing! Although I grew up in the back country and moved around from camp ground to camp ground, I graduated from tents, pop-up trailers to Air Streams to Fifth Wheelers. These are the BEST MEMORIES from my childhood. Reading your blogs make mom & dad (rest in peace) make all those memories of all those happy times come rushing back. Thank you for sharing and touching the lives you had no idea you are touching. You’re welcome, Sandy. I’m very pleased to have you along with us, and to hear how my tales bring back memories. We’re using the stroller and she’s walking some. Good to hear of her progress!! Thanks, Julie… I won’t be over there for a few days yet. Can’t write much now… low on charge and the sun went down…I appreciate your help. I made a trip along hwy 101 a few years ago with a friend, we tent camped, stayed in hotels and stayed with friends to curb costs. The Oregon coast was by far one of the most spectacular sites I have witnessed. I wanted to stay and stay and stay some more. So enjoyable to read your experiences with this pristine land! I enjoy your blog and hope you continue to share your journey. Best Wishes. Hi vinity… I’m glad you’re enjoying my blog. Thanks for the wishes. Just found your blog. I think one of my Facebook friends posted Rusty & Timbers story and that’s how I found you. I LOVE that response!!! Those short trailers are a real bear to back aren’t they? It was nice of the guy to offer to help but Jeeze. Traveling the US, especially the National Parks is on my Bucket List. I’m enjoying reading about your adventures! Hi, Linda… Good to have you with us! I believe gentlemen are conditioned to offer help to a lady. Especially when there still are many ladies who are dependent on a man to do things for them. I try not to offend when I turn down help . . . and take the opportunity to educate a little, too. Sue – ‘Happy Camp’ is inland on the Klamath River, down I-5 out of Grant’s Pass past Medford and Ashland to California and the little town of Hornbrook, then just south of town down Highway 96 and back to the coast. Not much of a town. Beautiful river but still pretty hot this time of year. If you are going down the coast this is not the place, but if you are going up 199 to Grant’s Pass, south on I-5 past Mt. Shasta (a volacainc ‘butte’ and worth seeing since it is isolated) and into California then 96 will take you to Bluff Creek and the REAL, original sighting of ‘Bigfoot’ – big feet tracked in the mud – (saved at the University of California, Berkeley) and out to Willow Creek and 299 to Arcata and the California Coast. Nice river for Spike to lay in but a bit pricey – Welcome to California! Hello Dave… I’ll keep your suggestion in mind. And I’ll keep an eye out for Bigfoot as I pass Mt. Shasta. Thanks for the welcome! It’s just gorgeous there, Sue!!! I generally can maneuver into tricky spots — unless I am very tired. Then my brain just shuts down and refuses to compute a link between the steering wheel and the trailer. Sad to admit I have let a stranger back me in a couple of times under those circumstances! I was embarrassed, but SO relieved to be in my site! Oh, no! You get practice by . . . um . . . practicing! Please, for the reputation of female campers everywhere, don’t give up to a stranger . . . Like I said somewhere else, backing in is ninety percent patience. If you’re tired, park your rig in a big open area, get a drink or something to eat, walk around a bit, get refreshed, and then git ‘er done! As I’m sure you know, short trips so you’re not tired at the end is the best solution. Advice I haven’t always followed, however . . .
WoW! Great photographs! You and your new camera seem to be of one spirit now! You make me want to visit Oregon now more than ever. Chuck… not so much… he has been there and done that but I think he will want to go more if we can find a working gig there! Today is Tuesday… did you make it to a vet yesterday for Bridget??? What is the diagnosis ??? Thanks for a great post today! I’m surprised people like these photos. There was enough fog or mist in the air to make the color dull (as it was really). To be honest, I don’t think I’d want a long workkamp along the Oregon Coast. Make sure it’s a sunny campground, if one exists. Sutton Campground was nice, but it felt gloomy after three days of deep shade. I think I’d get depressed over a lengthy period of time. Something to consider. I’ll be making a report on Bridget. She’s fine. I wrote a post about emptying the waste tank, complete with photos. Maybe a reader can tell you which post it was. Right now I’m camped in a shady (redwoods!) area and I have to use my solar power sparingly. Backing is simple… hold the bottom of the steering wheel, to make the trailer go left, turn wheel left, to go right, turn right… Do everything slowly with patience. Get out and look if you lose track of where the trailer is. Waste tanks and backing a trailer are what people fear the most and they’re probably what should be feared (if anything) the least! Nice to have you here, Mary Ann. This is the link Sue is referring to on how to dump waste tanks. Thank you Sharpei Mom! That post takes the mystery out of waste disposal. That’s such a neat looking trailer–everything efficient and functional. I think you may be a long lost cousin of mine. 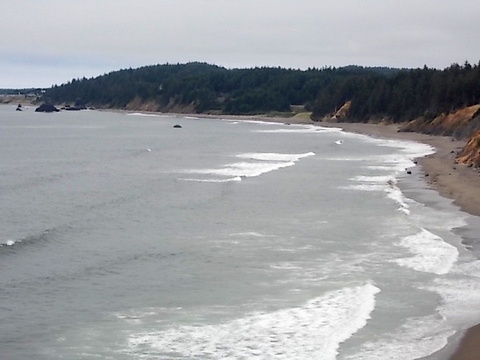 ( kidding) I think the Oregon Wash coast is pretty and I am glad I have seen it, but it is just to rainy ,overcast, expensive,and to many folks for this ole Texan. I have been sitting back wondering how long it would be before it hit you . Sue, Mo and I are just 2 miles from highway140 about 44 miles east of Medford and 30 miles west of Klamath Falls, if you choose to take that route. We could come and meet you at the highway if you like and point you in the direction of the free camping at Eagle Ridge. Not completely sure that your rig would find a way to turn around right here in our space, but we could talk about that as well if you like. I am home this week, since our Medicine Lake camping trip had to get postponed. Well! I’ve finally gotten to your blog … I have been told by several to come here to see you 😉 I am also a solo female traveler and am now in Oregon – Florence to be exact. I stayed at the Three Rivers Casino last night… am anxious to read your blog. I’ve been without cell service for days and had a ton of stuff to catch up on on! I’m at the library right now and still haven’t caught up with posting to my blog. I’m just up to last Thursday! I can’t comment on WordPress blogs from my iPhone — too tedious with all the signing in todoing. Hope to catch up with you but it seems you’re heading south and I’m going to go on up Highway 101 or 1 to Astoria to Portland then back down the coast to do Highway 1 all the way…. Don’t know where you might be at the moment but IF you are planning on seeing Mt Shasta it may be smoke covered. I talked to a Forest Service Hot Shot fire fighter this morning and he said there fires around Shasta. Went by Mt Shasta yesterday and I did not see any smoke. I could see the mountain ,but i did not go by the lake. Going to be close to 100 in Grants Pass today. 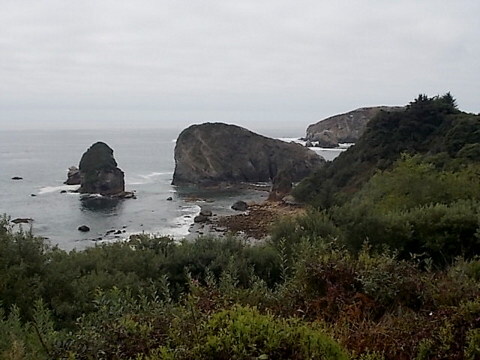 KFalls is much cooler,but after driving 199 the coast hwy you will probably need a break. LOVE reading your blog Sue. These pictures really are great. Does your camera have a viewfinderor are you just great with that LCD screen? Such lovely places you have been. I’d say you get an A+ for travel routes. Please, let us not start another mutli-posting barrage that questions rvSue’s wellbeing. She has a life as well as this bog, perhaps she is living it. Hi Sue: Hope all is well. It must be nice to be on the Pacific Coast, salt water is so calming. Such beautiful pictures. Also, I hope Bridget is doing okay. She looked so cute in the stroller. Slowly but surely I am decluttering and getting rid of stuff. It was hard getting started but now I am in a routine and it feels good. It’s a lot of preparation as you well know. Everyone has their own way of doing it. You’ve met so many nice people and also helped the man find his dog. By following your dream, you have been making such a difference in people’s lives. Blessings to you and will look forward to your next post! Dear husband and I will be spending 7 weeks in the Pacific northwest next summer with our trailer, a fun, but modest, 2417 TrailManor. Actually, part of the fun is because of our relatively obscure trailer – people often stop to watch as we swing it up into position upon arrival. Think traditional pop up canvas trailer, but all hard side, no canvas, and slightly bigger when opened up.